We don’t usually post about fashion, but Maison Martin Margiela is more than just fashion; it’s avant garde fashion that blurs lines between fashion, art, and design. Plus, Em has been a big fan for years and is the one who alerted me to the collaboration with H&M — which goes on sale tomorrow, November 15th — as well as introducing me to Margiela’s existence and work. Maison Martin Margiela is a French fashion house which has always followed its own path, often outside the conventional fashion framework. Constantly questioning the norms of fashion and presenting its pieces through the technique of deconstruction and transformation, the collections reinvent volumes, modify shapes, change the original use and movement of garments and derail classic notions of fashion. In addition, Margiela himself has maintained a very low profile throughout his career. He’s a bit of an enigma, never having had his picture taken publicly and remaining backstage after his runway shows. 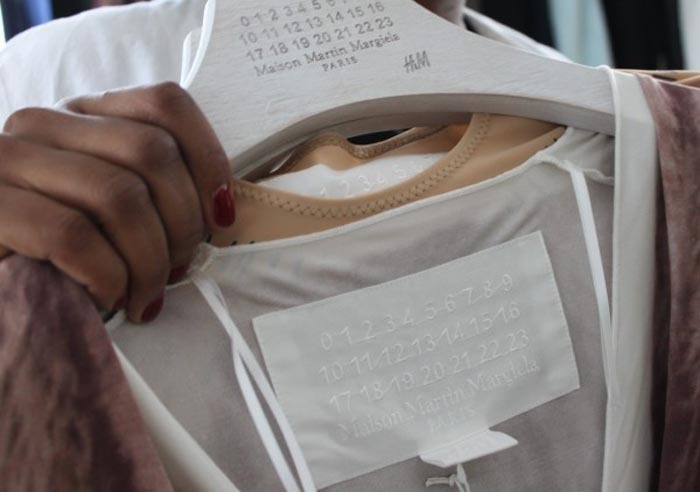 It has also been stated that Martin Margiela left the company in 2009 with no replacement appointed, but the company has continued and is now doing a Re-edition of previous seasons’ products for H&M. Most of the designs are full of wit along with edginess. Many of them use trompe l’oeil effects; the strapless bra body suit and the fishnet leggings are prime examples of these, as are the plexiglass heeled shoes and boots that seem to float in mid air. 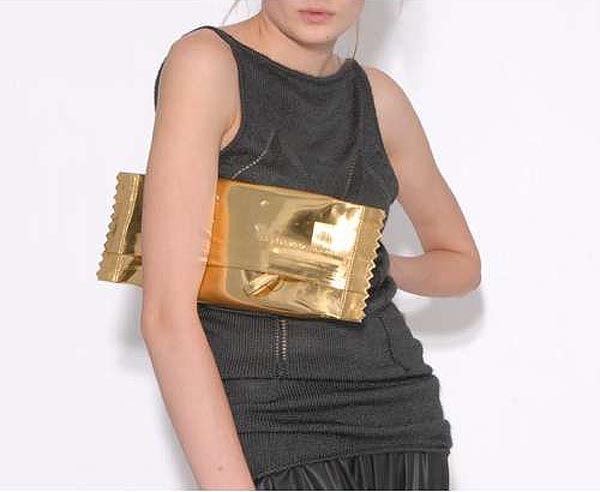 The Candy Wrapper Clutch is definitely goofy fun, as are the jacket made of belts and the Keyring Necklace. All the pieces in the collection are not your everyday clothes and accessories, and especially not typical of H&M’s, even in their prices, but it should be interesting to see what happens. All I know is that Em will be there at 8am on Thursday, with or without her sister. This entry was posted in Art, Event, Fashion, Fun, Pop Culture, Stuff We Like. Bookmark the permalink. I am so excited to see the collection in person. MMM is such a wonderfully unique fashion house, and that candy wrapper clutch is so damn cute!